NetSapiens CEO, Anand Buch, has made a drastic change in his appearance in the name of cancer research. This change comes twofold, first with a year long commitment to grow his hair past his shoulders and second with completely shaving off his new long locks for the St. Baldricks Foundation. St. Baldricks is an organization that funds research for institutions for lab and clinical research. Funding for cancer research has been saving lives, yet specific types of cancer are still very unknown and require much more research. The funding they receive through donations helps make clinical trials more available to children so that they can have the treatment that is right for them and offers them the best chance at survival. Their hair will be donated to a separate organization called Pantene Beautiful Lengths. 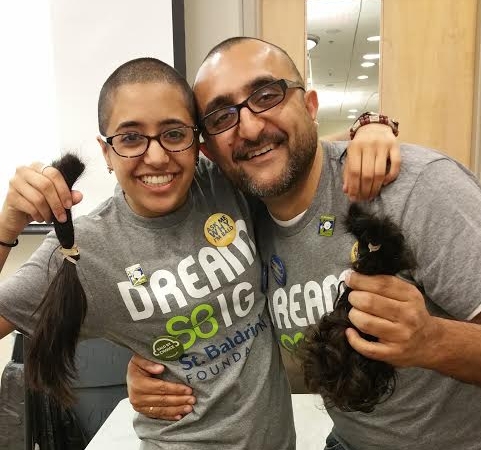 Although Anand has been active in charitable organizations in the past, it was his niece Sheel that prompted this effort to raise money for cancer research. Sheel is completing her freshman year at the University of Illinois on the path to being a health professional with a special interest in the brain. Her goal for getting involved with St. Baldricks was to not only raise awareness and funds for cancer research, but also to gain a deeper understanding of what many children have to go through when they have no choice but to say goodbye to their hair when undergoing chemotherapy treatment. When Sheel shared her plans with Anand, he felt a strong need to join his niece in these efforts. Anand explained, “ I was so inspired that a young lady like herself with such long, beautiful hair was willing to make the sacrifice.” “ When she was little I would ask her, ‘What are you going to do when you grow up?’ she would say ‘I’m going to change the world.’ Seeing her actually doing it really inspired me to join her. This is not the first time that members of NetSapiens have changed their appearance to help others. Last November, six members of the NetSapiens team joined together to participate in “Movember” with the goal of raising awareness and funds for men’s health. The men of the group grew mustaches for the entire month of November, sparking conversations and inspiring others to donate to the cause. The NetSapiens women also participated by joining the team with mustache stickers and contributing to the fundraising. Although the goal for the St. Baldricks Foundation donations has been reached and November has already passed, you are still able to contribute to both organizations through the links below.